More car crashes than Nascar! 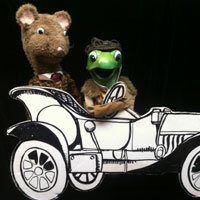 Mr. Toad can't get enough of those new-fangled motorcars and ooohhh the trouble he gets into! Mr. Mole, Mr. Rat, and Mr. Badger take it upon themselves to try and turn that Toad around as friends always should. Bunraku puppets and interactive fun are both incorporated in a fast-paced musical based on the classic tale by Kenneth Grahame. Fees: $539 single, $1078 double / Title I Schools may qualify for funding assistance. Requirements: Please note: audience size is up to 400. 20' x 20' x 8'h flat space minimum space requirement; access to one 110 outlet electrical outlet; space available one hour before and after performance for set up and load out. Teachers must be present at all times during performance.